The Union Public Service Commission UPSC CAPF AC 2018 examination’s Paper I and Paper II answer key will be available soon. The examination is conducted on 12th Aug 2018 for both the papers and the examination question papers are in four different set’s Set A, Set B, Set C and Set D, the official key will be released sets wise, many applications are invited for the test where there are only 398 vacancies for Assistant Commandant. Aspirants can cross check their answers marked in the exam according to their Set’s with the official key which will be available soon along with the cut off marks, aspirants can have an idea about their qualifying in the examination through this official key. Bundled applications are received this time to grab this opportunity and the number is in large as usually of the candidates who took the participation in the Central Armed Police Force. People are showing interest to join, work with Central Government and applying for the jobs. 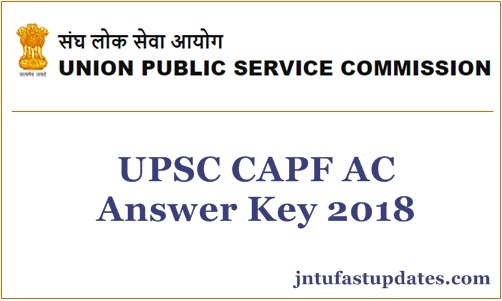 As part of this they have applied for The Union Public Service Commission UPSC CAPF AC 2018 exam also appeared for the exam and waiting for the official key which is yet to be released in the official web portal. The Union Public Service Commission UPSC CAPF AC 2018 examination has two papers, Paper-I and Paper-II with the weight age of 250(Paper-I), 200(Paper-II) marks with three hours duration for each paper. The type of questions are in multiple choice questions. Union Public Service Commission (UPSC) was established in the year 1926, it conducts examination and recruit people for All India Services and Group A & B of Central Services. As part of this the UPSC CAPA AC notification is released and the examination is also conducted to recruit total 398 candidates and will offer the appointment letter for those who clears all the rounds set by them. Cut-off marks will be set by the officials as per the category and based on the cut-off mark the candidates will be filtered. Please tell me that when release of capf ac answer key.